Aid Classifications let you create templates for your different financial aid applications. When you plug a classification into a student's aid application, it automatically supplies cost of attendance, enrollment information, and application components. When packaging aid, classifications can be used in concert with Aid Year Schedules to originate aid packages with COD. The two items supply key information for the financial package: Cost of Attendance, enrollment status, and a disbursement schedule (among other items). You can include aid classifications in aid year schedules (see the next setup step). To get started, go to Financial Aid > Settings > Aid Classifications. Give the classification a name—for example, Masters Part-Time or Undergraduate Online. 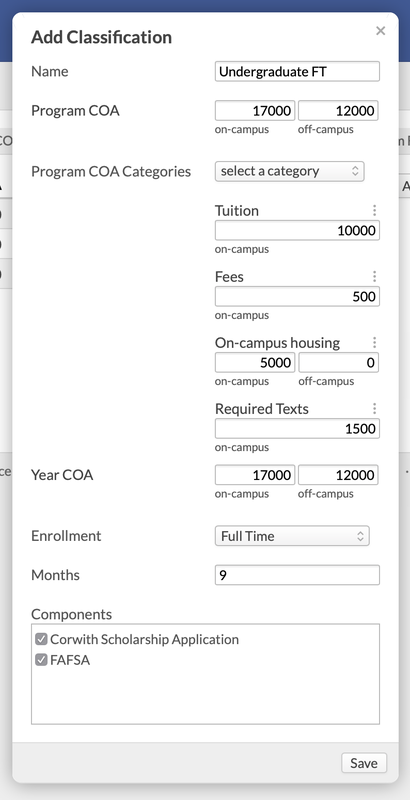 Enter the Year and Program cost of attendance (COA). Select the enrollment type: choose from Full Time, Three-quarter Time, Half Time, or Less than Half Time. Enter the number of months the student's program will occur in a given aid year. Check off the application components you want to include in this classification. To edit a classifcation, click its name and make your changes. Keep in mind that your changes will not be retroactive. Retire a classification by clicking . Next: set up aid year schedules.